A fire department (United States and Canada) or fire brigade (United Kingdom and Commonwealth) (also known as a fire and rescue service or simply fire service) is a public or private organization that provides predominantly emergency firefighting and rescue services for a specific geographic area, which is typically a municipality, county, or fire protection district. In the United States a fire brigade is the private firefighting organization of a company or enterprise, operated under rules from OSHA. A fire department usually contains one or more fire stations within its boundaries, and may be staffed by career firefighters, volunteer firefighters, or a combination thereof (referred to as a combination department). A fire department's jurisdiction is organized by the governmental body that controls the department, although there are private fire services as well. This comes from a municipality, county, prefecture, state, province, or nation type of government. The most common type of government control is at the municipality level. The jurisdiction size and organisation would be set up by a department or the government in charge of these duties. This deals with the placement of fire stations, equipment, and personnel within the area of control. Fire departments periodically survey their jurisdiction areas and use the data for redeploying proper coverage. This data comes from travel time, range from station, and/or a population survey. This brings equal service to the entire community and gives the department efficient places to launch operations. The earliest known firefighting service was formed in Ancient Rome by Egnatius Rufus who used his slaves to provide a free fire service. These men fought fires using bucket chains and also patrolled the streets with the authority to impose corporal punishment upon those who violated fire-prevention codes. The Emperor Augustus established a public fire department in 24 BCE, composed of 600 slaves distributed amongst seven fire stations in Rome. In the 19th century, the practice of fire brigades refusing to put out fires in buildings that were uninsured led to the demand of central command for fire companies. Cities began to form their own fire departments as a civil service to the public, obliging private fire companies to shut down, many merging their fire stations into the city's fire department. In 1833, London's ten independent brigades all merged to form the London Fire Engine Establishment (LFEE), with James Braidwood as the Chief Officer. Braidwood had previously been the fire chief in Edinburgh, where the world's first municipal fire service was founded in 1824, and he is now regarded, along with Van der Heyden, as one of founders of modern firefighting. The LFEE then was incorporated into the city's Metropolitan Fire Brigade in 1865 under Eyre Massey Shaw. In many countries or regions (e.g. 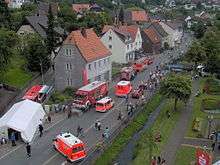 the United States, Germany, Japan), fire departments are often responsible for providing emergency medical services. Many firefighters are cross-trained as certified first responders, emergency medical technicians, ambulance technicians, or paramedics. Some services act only as "first responders" to medical emergencies, stabilizing victims until an ambulance can arrive. 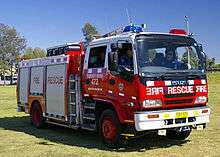 Many fire services also operate ambulance services. ↑ Cote, Arthur E. (2003). "Basics of Fire and Fire Science". Organizing for Fire And Rescue Services. Jones & Bartlett Publishers. p. 92. ISBN 978-0-87765-577-0. ↑ "Fire-brigades in the Roman realm". Economypoint.org. Retrieved 3 July 2010. ↑ Coe, Charles K. (February 2009). Handbook of Urban Services: A Basic Guide for Local Governments. M.E. Sharpe. p. 29. ISBN 978-0-7656-2294-5. Retrieved 4 October 2011. 1 2 Cote, Arthur E.; Bugbee, Percy (December 1988). Principles of fire protection. Jones & Bartlett Learning. p. 6. ISBN 978-0-87765-345-5. Retrieved 4 October 2011. ↑ "From Fire Marks to James Braidwood, the Surveyor who set up the Fire Brigade". Independent Surveyors Association. Retrieved 2011-10-04. ↑ "Firemarks and payments". London Fire Brigade. Retrieved 2011-10-04. 1 2 Hensler, Bruce (1 June 2011). Crucible of Fire: Nineteenth-Century Urban Fires and the Making of the Modern Fire Service. Potomac Books, Inc. pp. 1–2. ISBN 978-1-59797-684-8. Retrieved 4 October 2011. ↑ Klinoff, Robert (2007). "Public Fire Protection". Introduction to Fire Protection, 3rd Edition. Thomson Delmar Learning. p. 59. ISBN 978-1-4180-0177-3. ↑ "History - City of Boston". ↑ IFSTA (2004). Fire Service Orientation and Terminology. Fire Protection Publications, University of Oklahoma. ISBN 978-0-87939-232-1. ↑ "Museum shows off Canada's oldest fire department's history". The Chronicle Herald. ↑ "Established in 1773, the Petersburg Department of Fire, Rescue, and Emergency Services is one of the oldest organized fire departments in the country"
↑ "Petersburg, VA - Official Website - Fire, Rescue, and Emergency Services". ↑ "Petersburg, VA - Official Website - Fire Department History". ↑ "James Braidwood and the London Fire Engine Establishment (LFEE)". London Fire Brigade. Retrieved 2011-10-04. ↑ Grace, Kevin (Oct 29, 2012). Irish Cincinnati. Arcadia Publishing. p. 44. Retrieved 2013-05-06. ↑ ENR/PAZ // University Communications: Web // University of Notre Dame. "NDFD, nation's oldest university fire department, turns 135".